Interested in a second opinion? If you would like an evaluation of financial and investment strategies already in place, please arrange time for a candid conversation with me today. Interested in joining our team of Financial Advisors? If you are an experienced Financial Advisor looking to move in a new direction or gearing up for retirement, let’s grab breakfast to introduce ourselves. 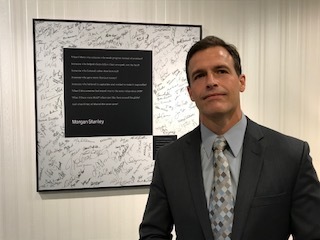 As a financial advisor with Morgan Stanley Wealth Management I enjoy the close family-like relationships I develop with our clients. I love learning about all the little details of their lives and what they really want out of life. We create sound retirement income strategies for people in or nearing retirement so they can have confidence that their retirement income will last as long as they do! We help businesses with their retirement plans for their employees and also making the best decisions on behalf of the owners. We will help maximize the efforts of your philanthropic passions or if you would like to leave a legacy for your family and loved ones. We offer fist class service and investment solutions to help provide financial peace of mind. We realize helping you meet your financial needs is our first priority. It’s our responsibility to evaluate and assess your financial situation and only make recommendations that are in your best interest, and we do so with integrity and transparency. Our experience is not just being knowledgeable about finances; we also understand the importance of priorities, family and confidence in your financial future.